« Yep! The Drought Is Over! Beautiful day today. Yesterday wasn’t bad either, except for the wind. 60s today and little wind. Saturday and Sunday are both supposed to be in the 60s. Sunshine tomorrow but clouds moving in on Sunday to make way for the showers on Monday. 50s Monday and Tuesday. Tuesday could also have some strong winds! Looks like Wednesday will be the coolest day of the week, upper 40s, but sunny. Thursday 50s and Friday low 60s. Lots of water right now. Running all four generators 24/7 since early Monday. We did make the turn late last night and are now seeing a slow drop in the level. At the current rate, it will probably be 5-6 days before we are back to power pool. Will they shut down then? Who knows? However, I would bet that they will continue to run something at least part of the days to be prepared for another big rain. Gina on the water Wednesday with Jim. Good day for him with the high water! Peach egg pattern and the big ruby were the bugs to drift. Also stripped the tiger tail some. Best part of the day was the quality of the fish. They look like they are being well fed. 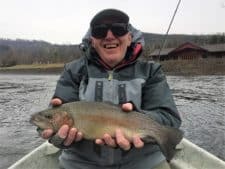 This entry was posted on Friday, March 2nd, 2018 at 2:12 pm	and is filed under Fishing Reports. You can follow any responses to this entry through the RSS 2.0 feed. You can leave a response, or trackback from your own site.